APLS Thermal Guard is a portable and disposable absorbent litter that provides maximum thermal protection during emergency transport. APLS Thermal Guard provides an integrated system for improved patient care: the highly absorbent cellulose core wicks fluids away from the patient, the fleece-lined bag and detachable hood retains body heat, and the treated nylon backing protects against wind and moisture. Two closable "L" shaped access points enable the patient to retain body heat while being treated by medical personnel. For added thermal protection, optional internal pockets provide a "heat zone" in four key areas when used with a mobile heat source. 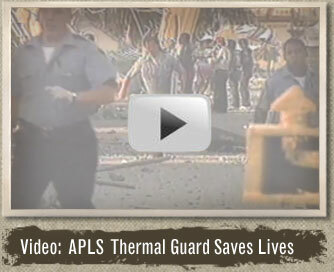 APLS Thermal Guard can retain 4.5 liters of bodily fluid while safely supporting up to 450 pounds. Two pockets inside the bag hold patient documents, x-ray disks and personal effects.